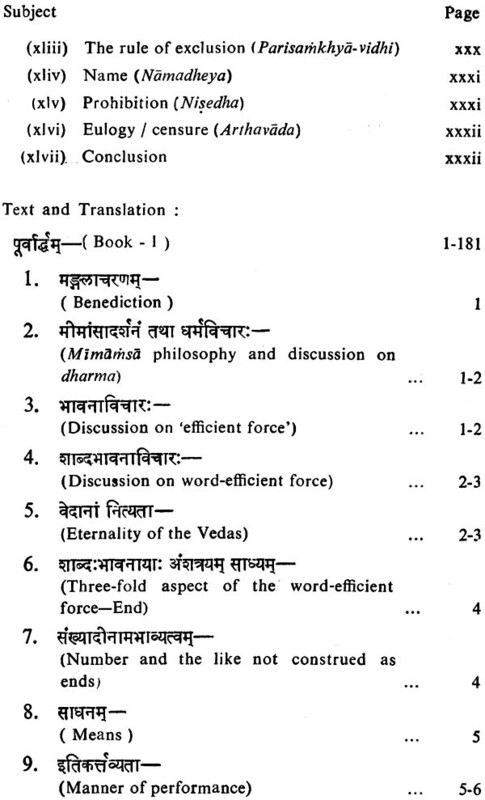 Mimamsa-Nyaya-Prakasa is a treatise on the system of the Mimamsa philosophy. The kind of the composition is technically known as Prakarana or which present the conclusions presents the conclusions of a particular school of thought in the precise form of a gist thereof. The system of Mimamsa developed into two schools known as Bhatta and Guru. The former was represented by Bhatta Kumarila and the latter by Guru Pyabhakara. The present work belongs to the Bhatta school. This school too, evolved into a few sub-schools. One such sub-school was represented by Parthasarathi-Misra. Apadeva, the author of the present work contributed to this school. The scope of discussion in the present work, however, is very limited. It is confined to the determination of ‘sentence-meaning’ or rather the meaning of a Vedic sentence only. Vedic sentences are of five kinds viz, Vidhi or injunction, mantra or invocation, namadheya or designation, nisedha or prohibition and arthavada or (praise, censure of) statement. Professor K. N. Chatterjee was born in the years 1930 in a wellknown family of traditional Sanskrit scholars in a remote village of Bengal. He graduated with Honours in Sanskrit and did his M.A. 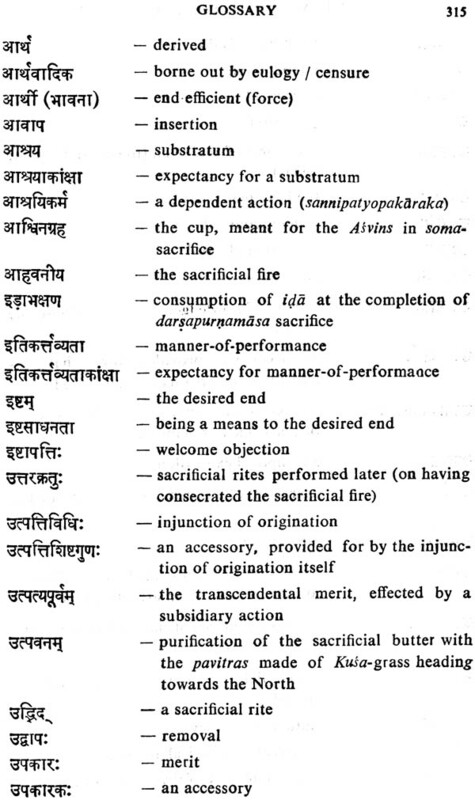 in Sanskrit from the University of Calcutta. He was awarded a Ph. D. degree by the same university and the D. Litt. degree by the University of Burdwan. Professor Chatterjee is best known for his works on various disciplines in Sanskrit and Indological studies. He represents the school of thought of late Professor Siddheswar Bhattacharya, under whose benign care and affection he got himself initiated into the diverse branches of sanskritic studies. He served various universities in the country in different capacities as teacher and has earned a name for himself on that account. He had occasions to deliver lectures on different topics in a number of university in and outside the country. Hs publications cover a wide range of studies like Navyanyaya, Vedanta, Mimamsa, Dharma-Sastra and Buddhism. Indian culture is traced to the ancient wisdom (Veda) embodied in the collections (Sainhitas) of hymns and their liturgical interpretations (Brahmanas). 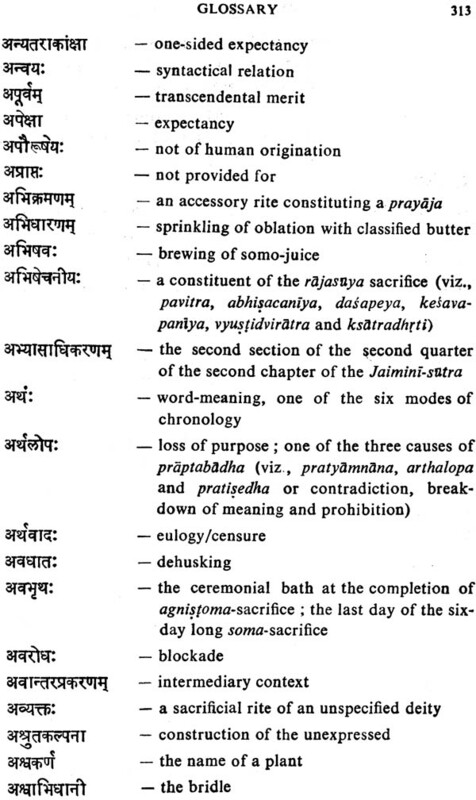 The Mimamsa-sutra of Jaimini is addressed to the formulation of principles of interpretation by splitting the Veda into Injunction (Vidhi), Hymn (Mantra), Name (Namadheya), Negation (Nisedha) and Eulogy/Censure (Arthavada) of its final import (Dharma). 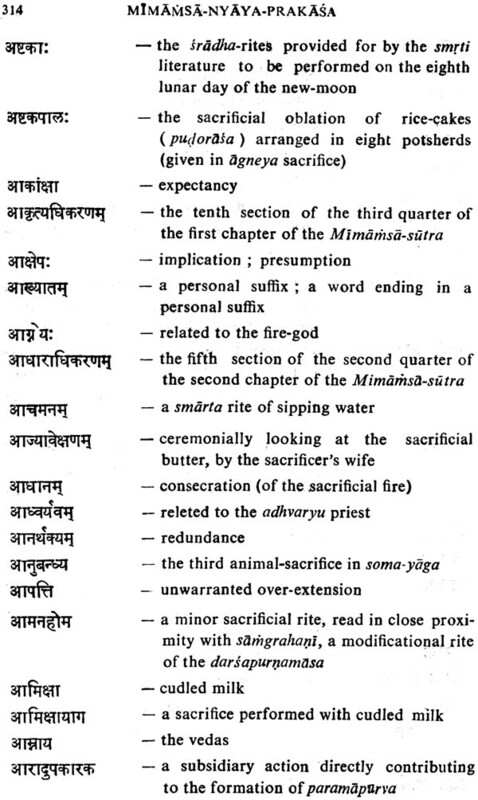 The Jaimini-sutra, condensed as it was, required a Sabara to write a comprehensive gloss (Bhasya) thereon. Prabhakara and Kumarla commented upon the Bhasya. Their writings started two school known as Guru-mata and Bhatta-mata. Of the two, Bhatta-mata has prevailed. 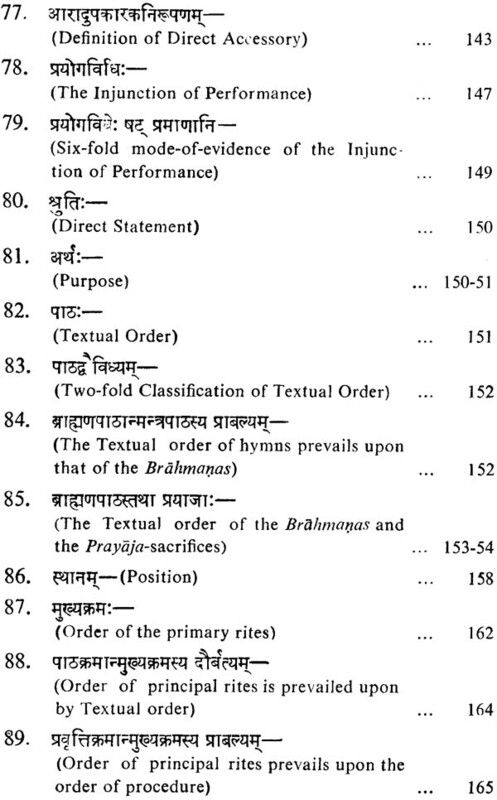 Fed and nourished by the Bhatta School, Apadeva (early seventeenth century) wrote Mimamsa-nyaya-prakasa, undying light (prakasa) on the principles (nyaya) of interpretation, brought to bear upon the judgment (mimamsa) that the final import of the Veda lies in Dharma which is Sacrifice (yaga). The work was the kernel of the Bhatta School. Well-documented, scholastic and bristling with the subtlety of analytical exposition, it commanded an unwavering attention of scholars, reflected in its being prescribed in the philosophical course of study, both modern and traditional. Yet excepting Edgerton’s English translation (1929) which with all credit to the translator was an approximation to the original, precious little has so far been done to make it accessible to the wider public. Its indispensability has been counterbalanced by the paucity of reading materias. This situation has been largely redeemed by the venture of Dr K.N. Chatterjee, Professor of Sanskrit, Department of Sanskrit, Rabindra Bharati University, Calcutta. Armed with the tool of neo-logic and firm grasp of the Bhatta School in its delicate shades, he has translated the text with placid ease and unchallengeable conviction. Introductory analysis of the topics contained in the present work, footnotes disentangling evasive knots, Jucid exposition of the principles of interpretation envisaged by Jaimini, excellent glossary have all added to the glory of unsparing attempt. I have no doubt that Dr Chatterjee’s endeavour will be matched by willing acclamation of scholars and students of Indian philosophy. It is indeed an important contribution in the department of knowledge, interspersed with abstruse terminology and highly specialised thinking. Philosophy in the widest sense of the term means ‘love for knowledge’. It is an attempt to know the reality of things and live accordingly. God, Nature, Man and the World, therefore, are enquired into and such enquiries its metaphysical aspect. The nature and scope of human knowledge is also investigated upon by it and such investigation forms its epistemological side. It also has an aspect of logic that concerns itself with reasoning and the problems related thereto. It also undertakes an investigation of the problems of morality and moral judgement, known as ethics. Mimamsa, as a system of philosophy does not believe in God. To later Mimamsakas, although God exists, He does not create the world conversely, He only recollects the Vedas at the end of an aeon (Kalpa). It is the Law of Karma or the Moral Law that governs the world, Mimamsa contends The world is real by itself, it holds. It, however, does not accept the materialistic view of the world as such. It believes in the ‘Soul’ as an eternal substance and adduces arguments in favour of that. It admits of different adduces arguments in favour of that. It admits of different kinds of valid knowledge and the sources thereof. The transcendental merit (apurva,) it maintains, that arises in the ‘Soul’ of man on the performance of a Vedic ritual, generates fruit and governs human destiny. It puts forward a philosophical explanation of the beliefs on which the doctrine of action (Karma) stands. 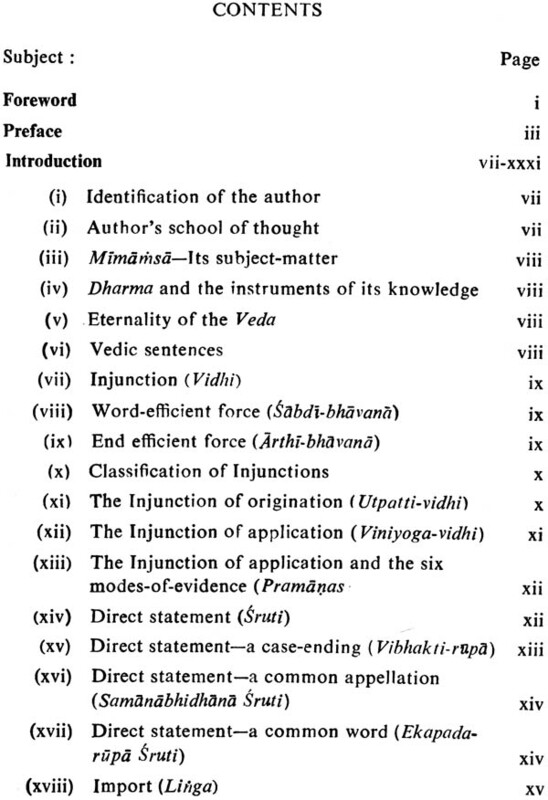 To support the doctrine of action, it also provides for a methodology of Vedic expressions. 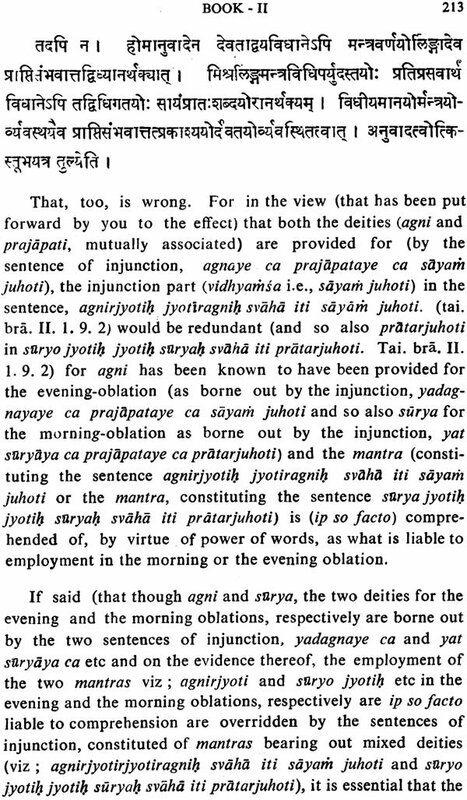 The Mimamsa-Nyaya-Prakasa addresses itself chiefly to the methodology of interpretation of Vedic sentences and it has fulfilled this task with uncommon ease. It is not, however, a mere compendium of the fundamentals of the Mimamsa philosophy. 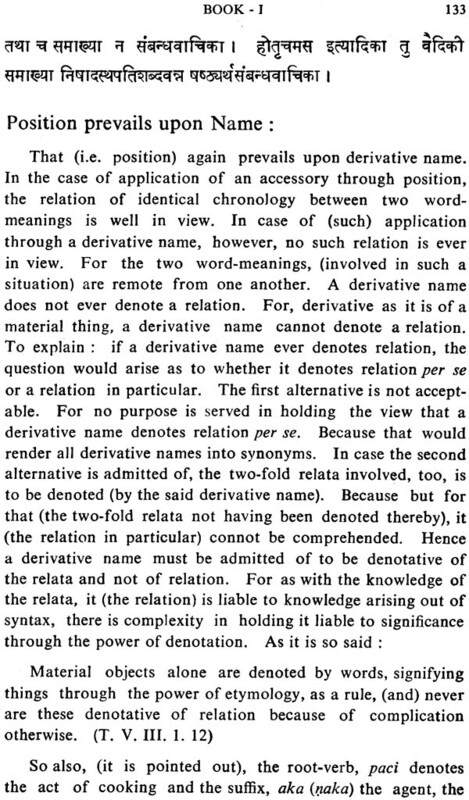 It is simultaneously a mature study on the problems of semantics as such. It throws light on the delicate shades of the different schools of thought like Navya-Nyaya, Vyakarana, Bhatta and Prabhakara-Mimamsa and holds out the nuances of diverse approach to different problems. The views of the different teachers of the Bhatta school itself which it is affiliated to, have been dealt with at considerable length. This is possibly the only work that so critically presents the view of the different masters of the Bhatta school of thought and makes a comparative estimate of their views. An English translation of this work has been a desideratum since long. Themes undertaken and issues raised in it when seen in the light of modern thought present a saga of interesting study. Professor Edgerton translated it into English as early as 1929. Unfortunately, however, his translation of the work has only been an approximation to the original. But for a sound grasp over the Navya-Nyaya technique, justice can hardly be done to a work of its kind. It is essential, therefore, that the wider reading public be presented with an English translation of the work seen in its proper perspective. Moreover, Edgerton’s translation having gone out of print decades ago, has much the more accentuated need of a fresh translation. 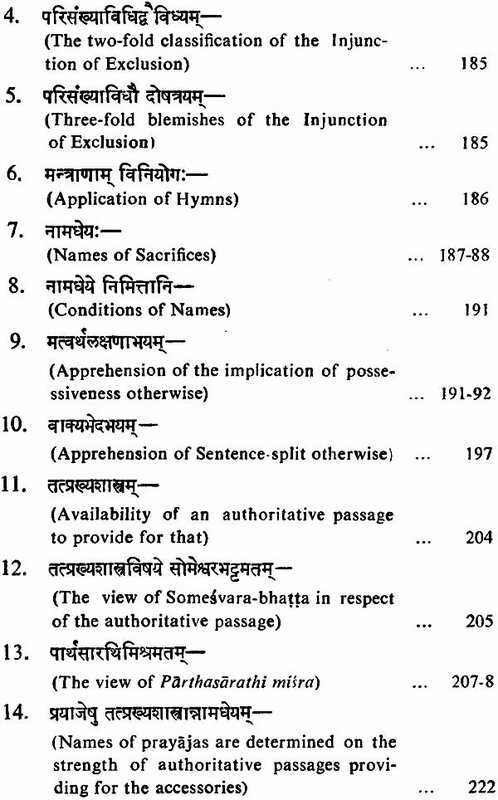 The present author has utilised his knowledge of the Naya-Nyaya technique of semantic analysis and mastery over the Mimamsa system of thought while translating the text. He has also given copious notes wherever necessary, to critically analyse important issues and make a comparative estimate thereof in the light of Navya- Nyaya and other schools of thought. He has taken all possible help and assistance available from the commentaries written on this work. Four commentaries are available at the moment, viz. the Bhattalamkara by Anantadeva, the son of Apadeva; the Arthadarsini by Krsnanatha Nyaya-pancanana; the Saravivecani by MM Cinnasvami Shastri and the Prabha by MM Abhyankara Shastri. The present author has taken all these commentaries into his account and has referred to all of them at different situations. A detailed introduction to the present work is given. It should help the reader to get a comprehensive idea of the problems discussed in it and primary acquaintance with the work. It will be of much help also to teachers and students alike of the Post-Graduate classes that have it on the syllabi. A number of indices have been suffixed to the work viz. an index of authorities cited, an index of maxims, an index of quotations and their sources, a glossarial index and a subject-index. All this has added an additional charm to the work of translation. 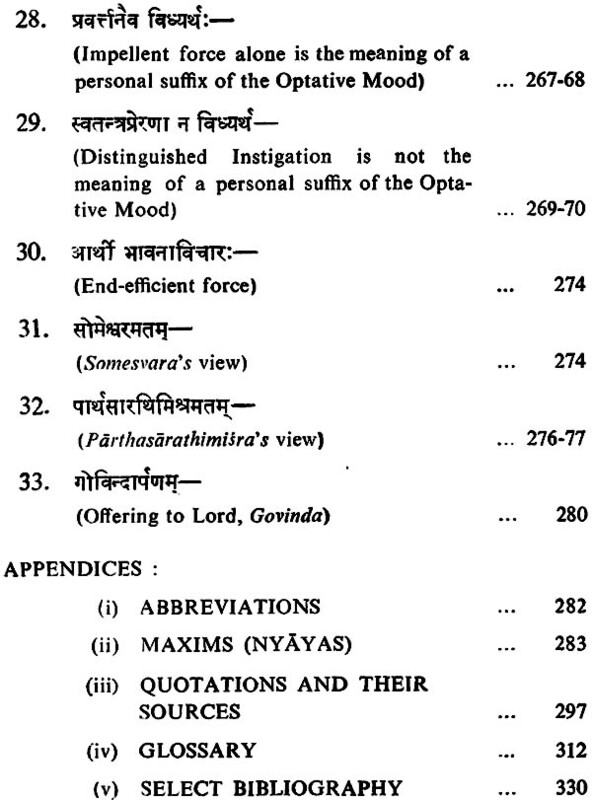 The present work is the outcome of the author’s long association with Dr Siddheshvar Bhattacharya, the savant logician of the present-day India, with whom he had the unique privilege of reading many a text on Indian philosophy including the Mimamsa-Nyaya-Prakasa. But for his grace, the present work would not have the light of the day. The author is so happy that his blessings been communicated through the erudite foreword that he has so kindly written for the present work. The author also remembers his loving and ever benign parents whom he lost at an interval of one month when the work was in progress. He also recollects his grandparents who had desired him to tread the path of Sanskrit learning. The author gratefully bows down his head to them. In fine, the author pays his homage to his erstwhile teachers like Late Surendranath Bhattachrya, Dr Haripada Chakravarti, Dr Rama Ranjan Mukherji, Dr Krishnagopal Goswami, Late Dr Amaresvar Thakur, Late MM Cinnasvami Shastri, Late MM Sitaram Shastri, Late Dr Satkari Mukherjee, Late MM Yogendranath Tarkavedanta- tirtba and Dr P.C. Bagchi. The author is particularly indebted to Professor Rama Ranjan Mukherji who as Vice- Chancellor, Rabindra Bharati University, arranged funds from theMinistry of Education, Govt of India, for the publication of the book by his University. He is also grateful to the present authorities of the Rabindra Bharati University for having undertaken the responsibility of the publication of the book. The author also puts on record the help and assistance he has received from his colleagues like Sri Nabanarayan Bandyopadhyay and others who have so kindly read the proof and have seen the book through the press. Thanks are also due to the B.B. Co. For having rendered qualified service of printing. 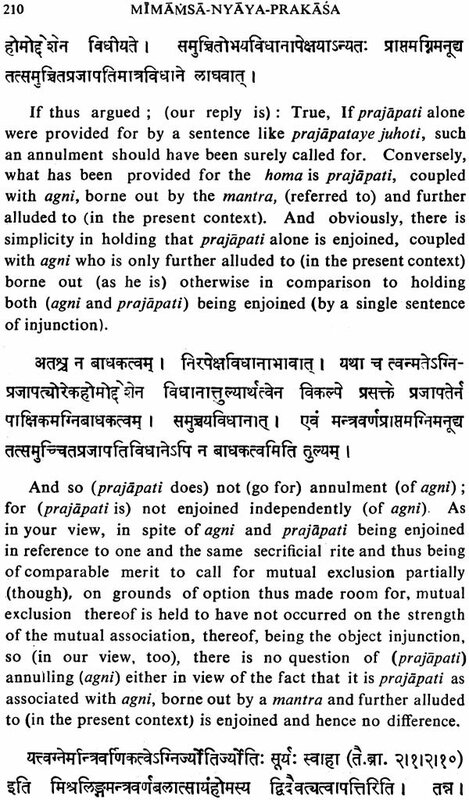 The Mimamsa-Nyaya-Prakasa of Apadeva, otherwise known as Apadevi is one of the most outstanding works on the Mimamsa system of philosophy. 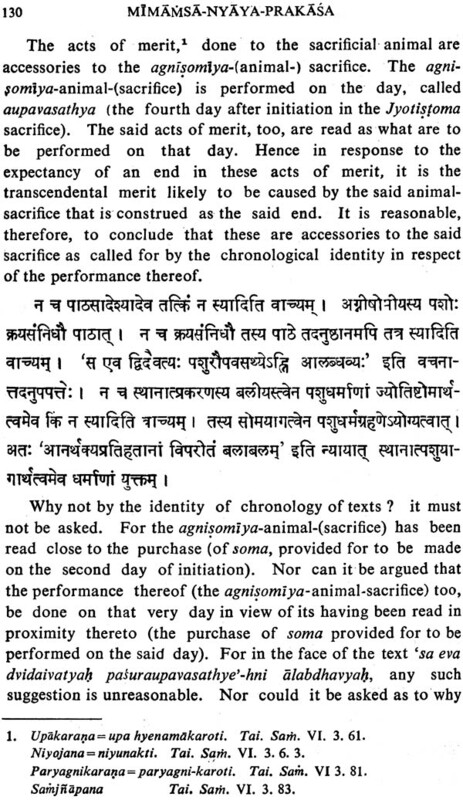 Although it is not an original composition and Apadeva himself does not claim such originality for the views expressed in it, this work ranks high as a perennial source of learning and it sums up the fundamentals of the Bhatta school of Mimamsa thought. Nothing much is known about the life of the author except that he hailed from a Maharastrian family of Sanskrit scholars. His father, Anantadeva, was a well known Mimamsa-scholar. Anantadeva initiated his son viz. Apadeva to the learning of Mimamsa and Vedanta. Apadeva, therefore, had written a commentary on the Vedantasara, called Dipika. 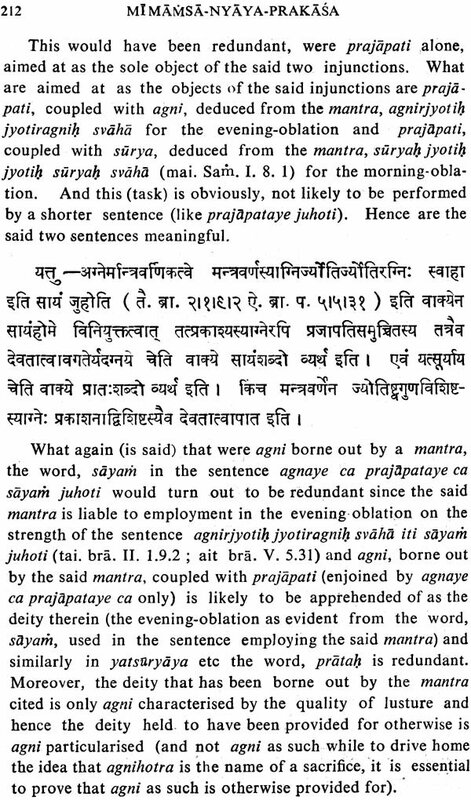 Apadeva’s son, also Anantadeva by name, refers to his father in the commentary that he wrote on the Mimamsa-Nyaya-Prakasa, called Bhattalamkara. Khandadeva, the author of Bhatta-dipika, criticises both the Mimam a-Nyaya-Prakasa and the commentary, Bhattalam-kara. Khandadeva is said to have died in the year 1665 at Beneras. 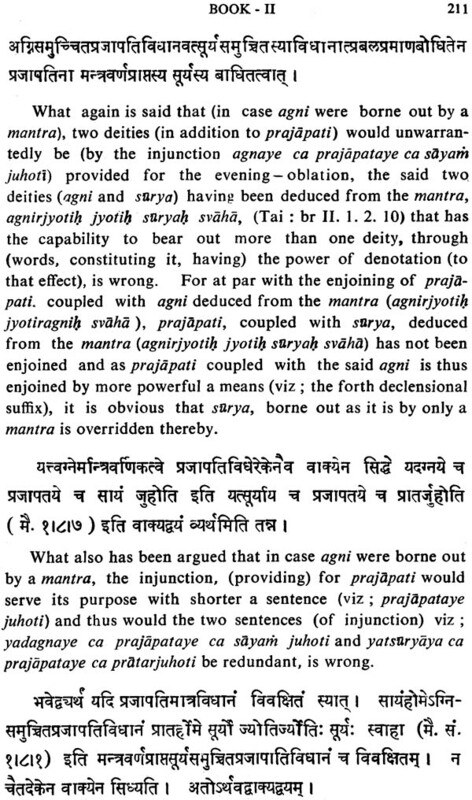 Apadeva, therefore, appears to have flourished during the early part of the seventeenth century. 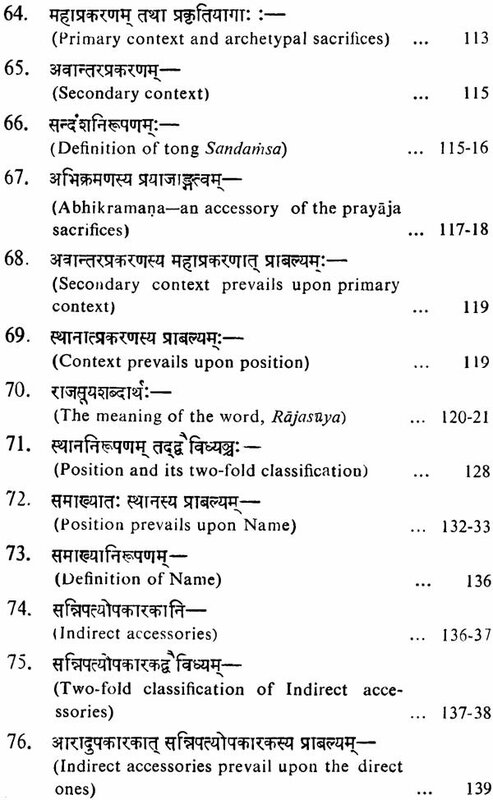 The Mimamsa-Nyaya-Prakasa, as the name suggests, is a compendium of the Mimamsa system of thought. It summarises and restates the fundamental doctrines of this system in the light of Kumarila, the founder of a school of Mimamsa, known after his names as the Bhatta school. The Bhatta school has been subdivided into a number of branches, each headed by a great Acarya of the fame of Parthasarathimisra Somesvara, Mandanamisra and the like. 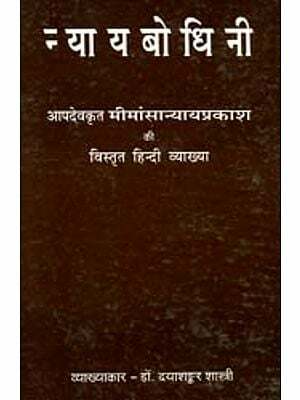 Apadeva belongs to the camp of Parthasarathimisra whom he considers as the world in matters of controversy. 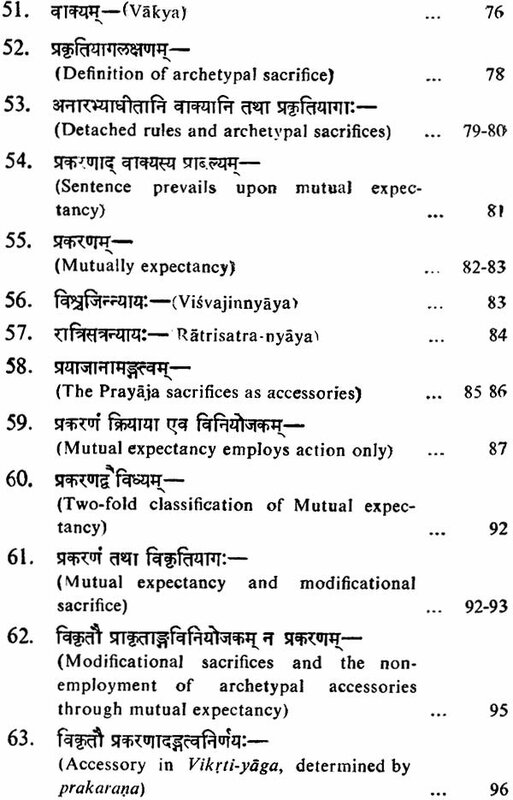 The aim of the Mimamsa system is the exposition of dharma and by dharma is meant a sacrifice or a matter, enjoined by Veda, purposive and recognised as a means to human welfare. The Veda in its entirety is the only instrument of valid knowledge on dharma in as much as it has been commended for study. No part of the Veda is meaningless since nothing meaningless can be commended for study. The Veda is eternal (apauruseya)-neither composed by anybody nor delivered by divine authority. 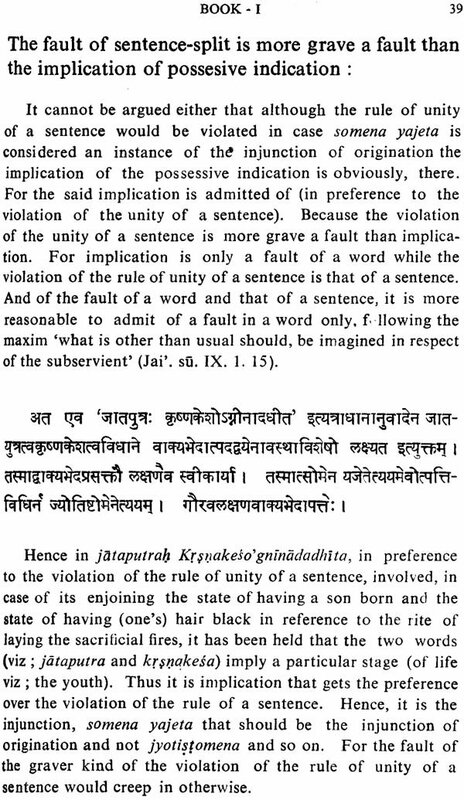 That the Veda is not composed by anybody is borne out by the fact that none in memory may be claimed as the author thereof. 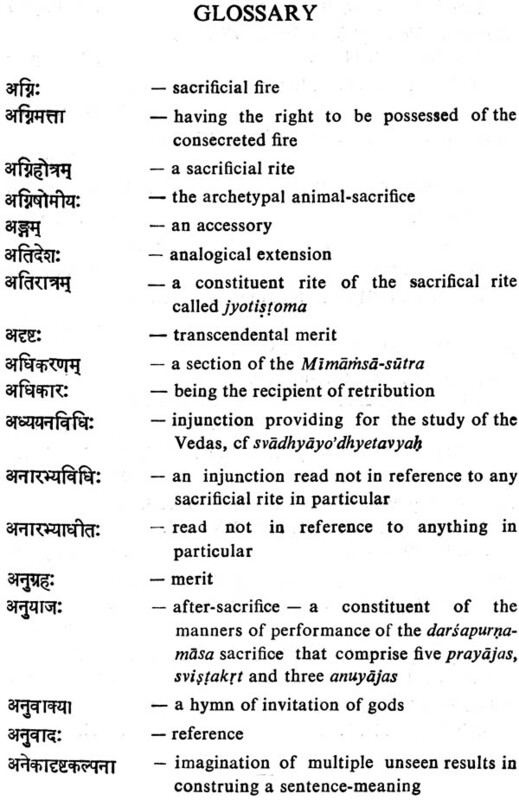 The study of the Veda is an unbroken chain of disciples and preceptors, that rules out the possibility of its composition. As to the possibility of its delivery by divine authority, opinions differ. 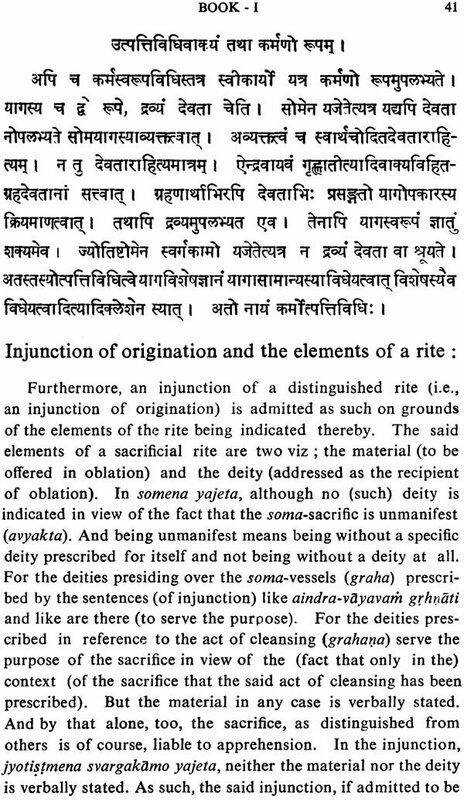 The Veda is said to have been revealed itself through the seers (Rsis). According to Neo-Mimamsakas, however, the Veda is delivered by God at the beginning of every aeon and at the end of every aeon, it is subsumed in Him. 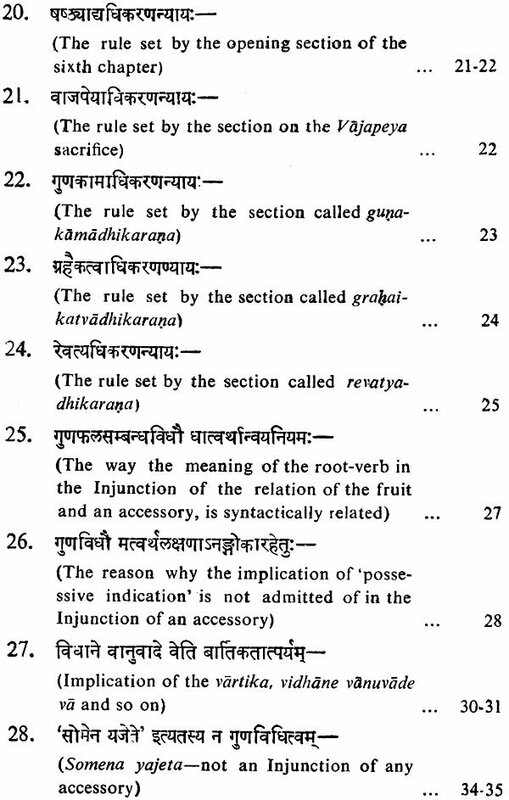 According to the Mimamsa system, Vedic sentences are of five kinds-injunction (vidhi). hymn (mantra), name (namadheya), prohibition (nisedha) and eulogy/censure (arthavada). 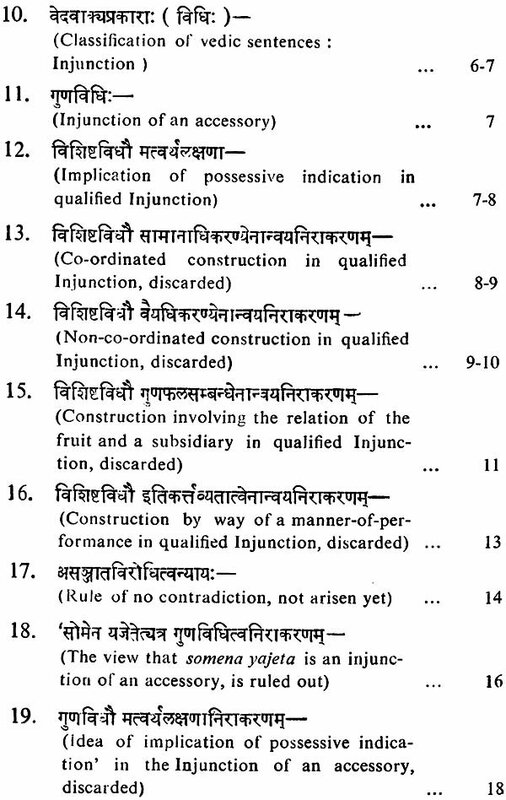 Injunction (vidhi) is technically known as codana because of its impellent nature. 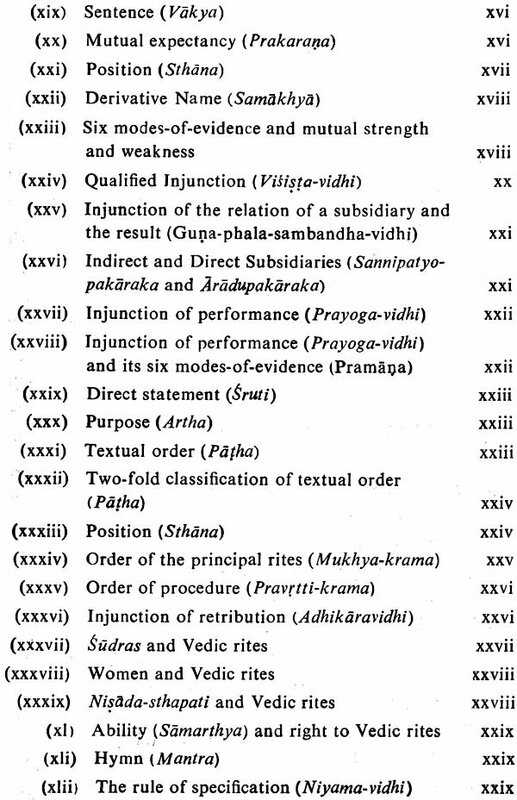 It is the pivot of the Veda. 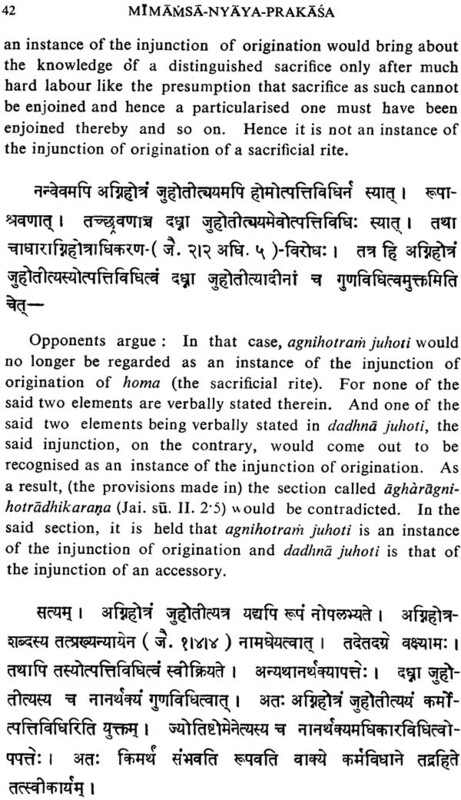 The principal element in an injunction or vidhi-sentence is the verb in the optative form like yajeta. Such verbal complex has two elements-a root-verb and an ending. The ending again has two aspects-the tense and the mood, expressing verbality and optativeness respectively. 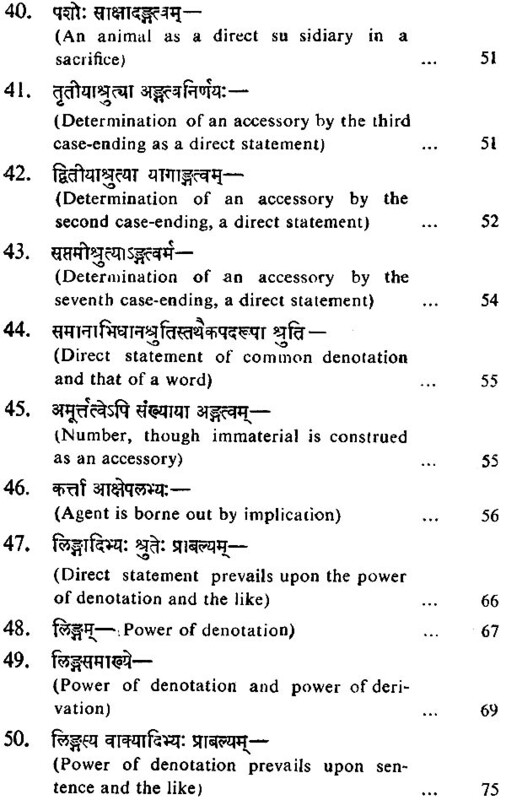 An optative ending (or its equivalent) expresses the ‘efficient-force’ (bhavana). 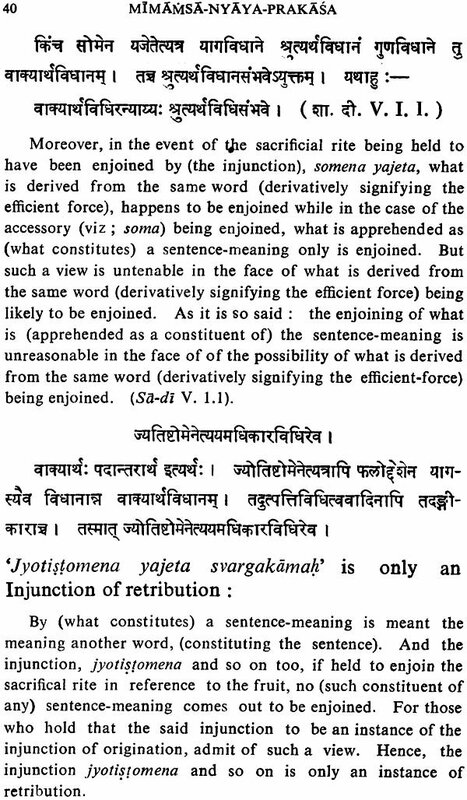 Such ‘efficient-force’ may either be optative (sabdi) or verbal (arthi in so far as it is expressed by the verbal ending in term of its optativeness (lingtva) or verbality (akhyatatva). Both Somesvara and Parthasarathimisra maintain that sabdi bhavana is the meaning of a Vedic verbal suffix in its optative form, that such meaning is operation (vyapara) and that such operation generates arthi bhavana. 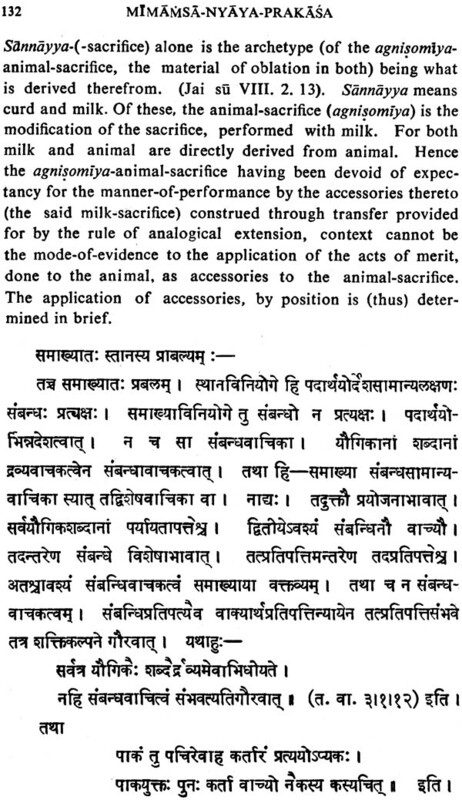 But while Somesvara considers such operation to inhere in the Vedic verbal suffix in its optative form, Parthasarathimisra takes this operation as being the of a desired goal (istasadhanata) and thus inherent in sacrifice that leads to the desired goal viz. Heaven etc. Both Somesvara and Parthasarathimisra hold that Vedic arthi bhavana produces the desired goal viz. heaven etc. According to Somesvara, arthi bhavana is the mental effort or determination (yatna) promoted by the desire to obtain the said goal and concerned with sacrifice etc. 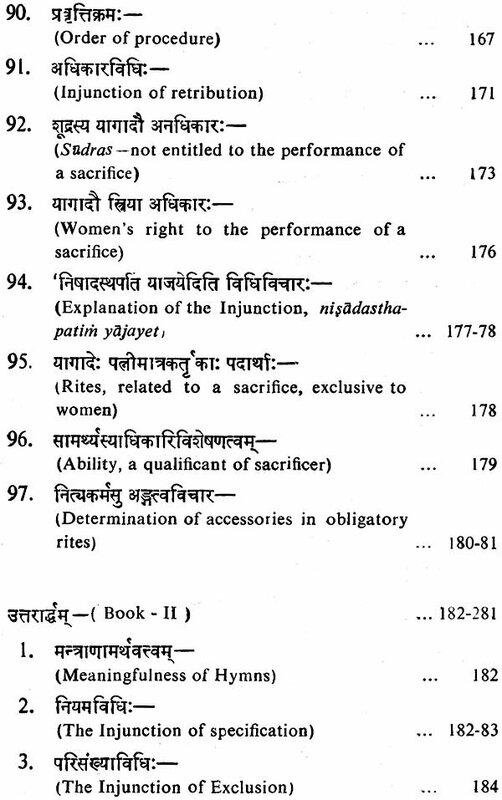 But Parthasarathimisra considers it an intermediary operation (vyapara) between sacrifice etc. viz. The instrument and the desired goal like heaven etc. 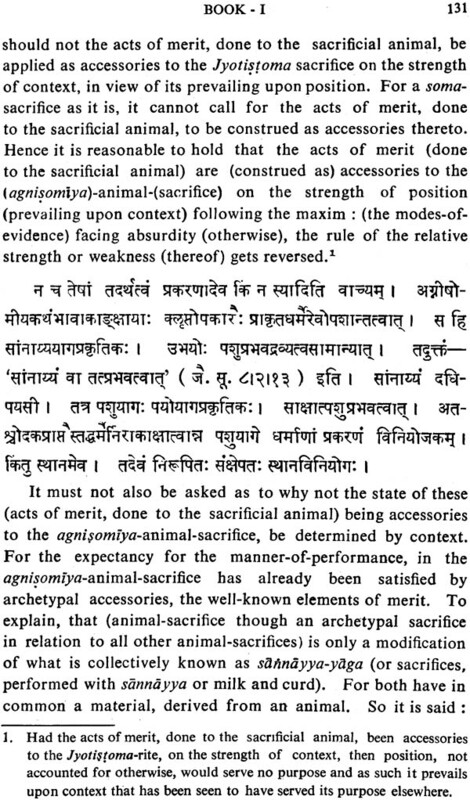 Such intermediary operation may be determination on the part of the performer of a sacrifice or a desire or a mere operation as specific situation demands. Injunction or vidhi sentence is of four kinds-the injunction of origination (utpatti-vidhi)), that of application (viniyoga-vidhi), that of (the sequence of) performances (prayoga-vidhi) and that of ownership to retribution (adhikara- vidhi).